2. Find the "Other Calibrations" section at the bottom. 3. If the error occurred after the disc was placed in the printer, click "Calibrate Disc in Printer"
4. 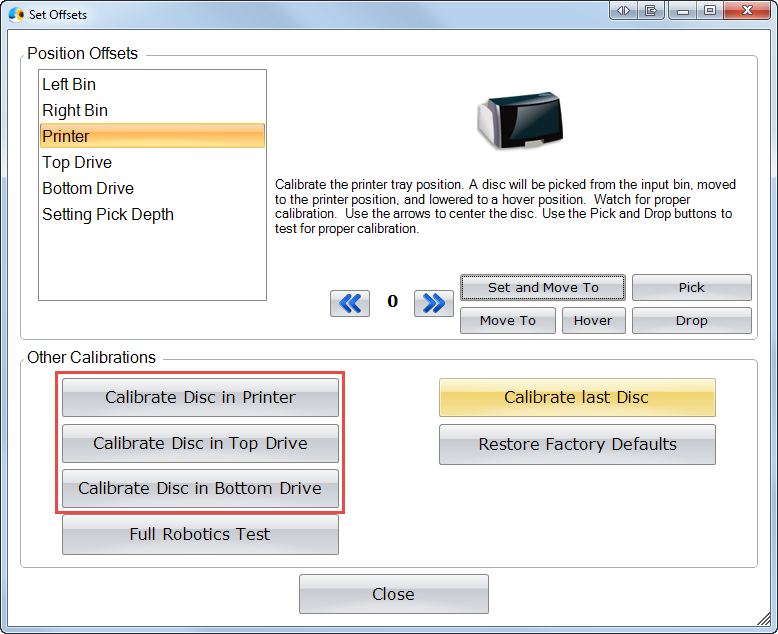 If the error occurred after the disc was placed in one of the drives, click "Calibrate Disc in Top Drive" or "Calibrate Disc in Bottom Drive". 5. If you are unsure where the last disc placement was, perform all three calibrations in steps 3 and 4. Note: Calibrate last Disc is only used to increase the accuracy of the disc bin counts and fix problems switching between bins in kiosk mode. The 4100, 4200 series and the Xi have advanced double pick detection that requires these special calibrations described above. 3. Click Calibrate last Disc. For Mac OS 10.5 or older use these stand alone calibration utilities. Bravo places a disc into the printer tray, pulls the tray in and ejects the tray right back out and the left light starts flashing before ever printing on the disc.